Put the zest and juice of a lemon in a bowl. Glug in about 4 tablespoons olive oil, add two crushed garlic cloves and a couple of teaspoons of chopped fresh thyme. Stir about. Throw in 16 peeled uncooked big prawns. Cube the fish and add to the bowl. Toss about in the juice. Thread fish cubes and prawns evenly on four skewers. Wrap two thin rashers of smoked streaky bacon around each kebab, and grill both sides for about 5 minutes or until the bacon is done. Don’t waste the superb juices, in fact best to line the grill with foil to catch them. 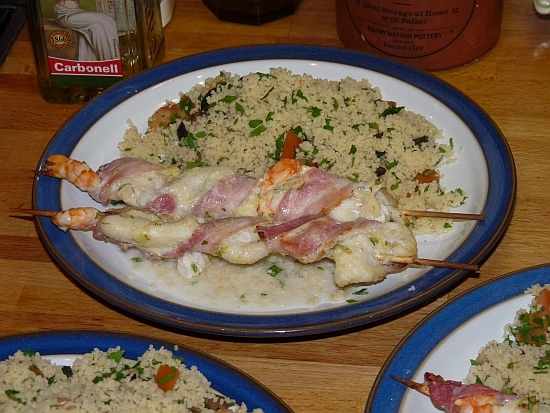 Serve with couscous and the juices, with tzaziki. If you don’t have any just mix finely chopped cucumber, chopped fresh mint and Greek yogurt to make a sauce on the side. Heaven, especially with a chilled white wine. Whoever said whiting and pouting were dull? (Adapted from a Good Housekeeping recipe).